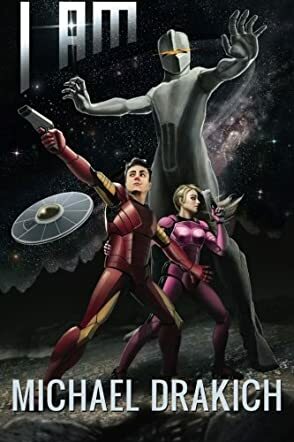 Adam Spenceworth has it all: a custom spaceship run by Mum, his first AI; his friend and protector robot, Gort; and his sexbot, Eve, who can morph to meet all of his desires. Adam has the privileged of living lifetime after lifetime due to a special regeneration chamber that returns him to age 25 so he can repeatedly live again to study, learn, grow, and continue life as a genius in robotics and science. The only problem is that each regeneration takes longer, resulting in strained relations with his robotic family, and the lengthening delays between lifetimes constantly throw Adam into the schism of a changing humanity, and the alien races that cooperate with and threaten them. I Am by Michael Drakich is a thrilling ride into Earth's future that will leave you wanting more. I Am is a brilliant novel that shows readers what sci fi writers constantly wonder about: how the future will unfold, and how humanity will adapt to it. Michael Drakich's visions of humanity's increasing dependence on robotics as they find themselves outnumbered by hostile aliens makes you think about where we're heading, and if our advances are truly advancing us as a race, or weakening our ability to deal with the future. Does technology help us adapt, or help us escape from a reality that we'd rather not face? How we adapt to a changing world and relationships with others is critical to our survival, and Adam shows how a good attitude, determination, intelligence, and ingenuity can help one man persevere and save an entire race. I Am is a great book that's everything sci fi should be. It doesn't paint the future as utopian or dystopian, but merely as evolving in natural relation to our surroundings, environment, and reality. An excellent read. I highly recommend it!